What Is Going on With This Major Star Trek: Discovery Moment? The midseason finale of Star Trek: Discovery was the best episode of the show so far, with clever writing, gripping performances, and a genuinely exciting cliffhanger that takes us away from that cumbersome Klingon War, at least for a few episodes. Unfortunately, the way we got there looks to include a plot hole so large you could fit Stamets’ galaxy brain through it. 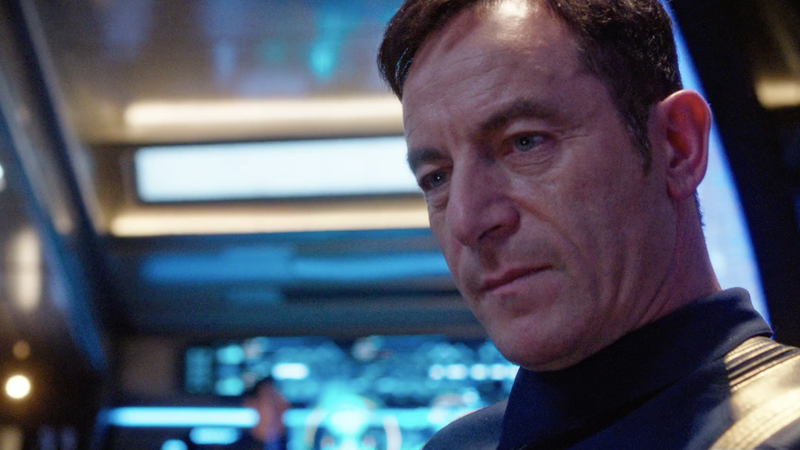 By the time we come to the end of “Into the Forest I Go,” we find Captain Lorca (Jason Isaacs) in a bind. Sure, he’s been commended as a hero for figuring out how to see through the Klingon cloaking technology—but Admiral Cornwell (Jayne Brook), whom Lorca last saw saying she was going to take his ship away, is alive. He even a) suggested she go negotiate with Klingons and b) didn’t go charging to her rescue once she was captured in order to keep himself captain. Once she recovers, he’s screwed. Plus, he’s about to lose the Discovery’s powers anyway: Stamets (Anthony Rapp) tells Lorca that he plans on ending his navigational escapades after “one final jump” back to Starfleet. No Stamets means, again, he’s screwed. For reasons that will likely be explained in the second half of the first season, Lorca appears to sabotage their final jump. We see him access the navigational controls on his chair, which show all the jumps they took during the episode’s main mission to detect the Klingon cloaking device. He enters a manual override code and the final jump changes. What looks to be their upcoming jump to a specific location, namely the Starfleet base, has now been changed to “Unknown.” And lo and behold, that’s exactly where they end up. Only, there’s a problem that contradicts a major part of the episode. The unknown jump that’s seemingly transporting them to one of those pockets of unknown space in Lorca’s giant Stamets mind map is #133. But, you see, they’ve already done 133 jumps—that was the exact amount of jumps needed to scan the Klingon ship. This means they repeated a jump they already did, with different results, without explanation. And no, Lorca isn’t accessing the archived jump list from the episode’s main mission. As shown in the photo below, during the major 133-jump sequence, number 133 is clearly displayed with an “071-MARK” location being filled in. They did all 133 jumps. The entire trip was mapped and completed—Lorca didn’t mess with it beforehand. Besides, why would Lorca have secretly charted the final jump to go somewhere unknown, when that would have jeopardized the entire mission? It’s possible he could have changed the coordinates of the last jump, because they were meant to leave, but then he refused to leave Burnham (Sonequa Martin-Green) and Tyler (Shazad Latif)? But that makes no sense, since they needed to jump around the Klingon ship to gather the data, and couldn’t finish the mapping from somewhere else entirely. I mean, maybe he was last-second swapping the final jump’s logs with the 133rd jump’s logs, so that it doesn’t look like they jumped at all when they vanished. But what would that accomplish? To hide a jump from a location Starfleet already knew about, to a place they can’t track because it’s literally unknown? The most likely answer is that there was a goof. That it was supposed to read as the 134th jump, the one after their big venture, but the graphic got screwed up. (Side note: why is this the 134th jump? They’ve jumped a lot, shouldn’t the numbering restart after the linked jumps are over?) This seems more likely, but would be pretty disappointing. Lorca’s actions set up a major plot point for the rest of the season. He’s positioned to be a truly villainous character who intentionally sent the Discovery to an unknown land—either to cover up his tracks, or for another nefarious purpose. If it’s not part of some genius plan I’m not catching onto, it means no one noticed this glaring error and thought to fix it before it was too late.